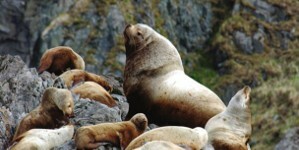 The biology of the Steller sea lion (Eumetopias jubatus) has been the subject of intense scientific investigation. This is primarily due to the rapid decline of population size in the western part of the species’ range since the 1970s and the subsequent Threatened and Endangered species listings that had direct impact on the management of one of the world’s largest fisheries. The Steller sea lion has emerged as an indicator species representing the environmental health of the North Pacific Ocean and Bering Sea. In this study, to better understand the historical processes that have culminated in the extant populations of E. jubatus, a large genetic data set consisting of 3 mitochondrial regions for >1,000 individuals was analyzed from multiple phylogeographic and demographic perspectives. The results describe the role of climate change in shaping the population structure of E. jubatus. Climatically associated historical processes apparently involved differential demographic responses to ice ages (and putative glacial vicariance) dependent on population size. Ice ages during times of small effective population size promoted restricted gene flow and fragmentation, and ice ages occurring during times of large population size promoted gene flow and dispersal. These results illustrate that effective population size has a profound effect on how species respond to climate change, an observation with obvious implications for large mammals and endangered species under the present conditions of imminent anthropogenically caused climate change. In addition, the results confirm previous observations of strongly biased historic and contemporary gene flow involving dispersal from west to east. Furthermore, phylogenetic patterns in combination with available fossil data suggest the potential of an Asian origin of E. jubatus. The results of this study provide a detailed scenario for the history that has shaped contemporary populations of E. jubatus.